Research indicates energy savings of between 50 – 80% on heating and cooling in hemp buildings. A lime-hemp wall of 200mm depth provides levels of thermal and acoustic insulation well above regulation standard. It also regulates the internal relative humidity and temperature swings ‘through hygroscopic material behaviour, contributing to healthier building spaces and providing effective thermal mass’.The building envelope is vapour permeable which allows moisture in the building to migrate out and eliminates the likelihood of condensation on internal faces. 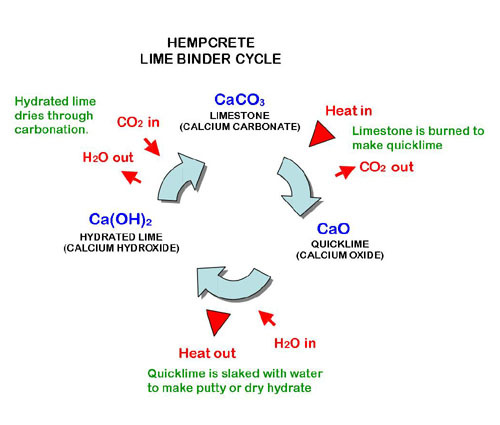 The mixture of hemp shiv and a lime-based binder with the addition of water produces a bio-composite material often called hemp-lime . 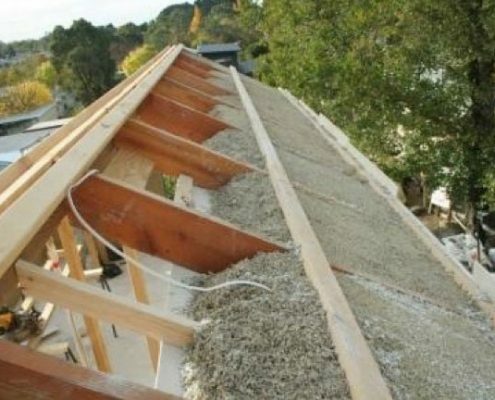 As with the early use of hemp within concrete, in hemp-lime the shiv performs as a lightweight aggregate and the lime as binder and preservative. This composite material is rigid, lightweight and durable, while achieving high levels of thermal insulation and vapour permeability. Lime’s unique chemical and physical properties are ideal for its combination with hemp. Throughout the lime’s curing process it retains a high permeability which allows vapour to migrate through the composite, therefore allowing the hemp chips to dry out completely. This coupled with the lime’s alkalinity, acting as a natural biocide, ensures the hemp shiv is safe from mould and bacterial attack. It reduces energy consumption because of its excellent insulation and airtightness. There is little heating or cooling losses from the building which means constant energy output to keep the building cool or warm is not required. Because hempcrete has low effusivity and high thermal inertia, it does not take as long to heat a house but once heated, it will slowly release heat back in when the temperature drops … so the heater doesn’t need to stay on all night.